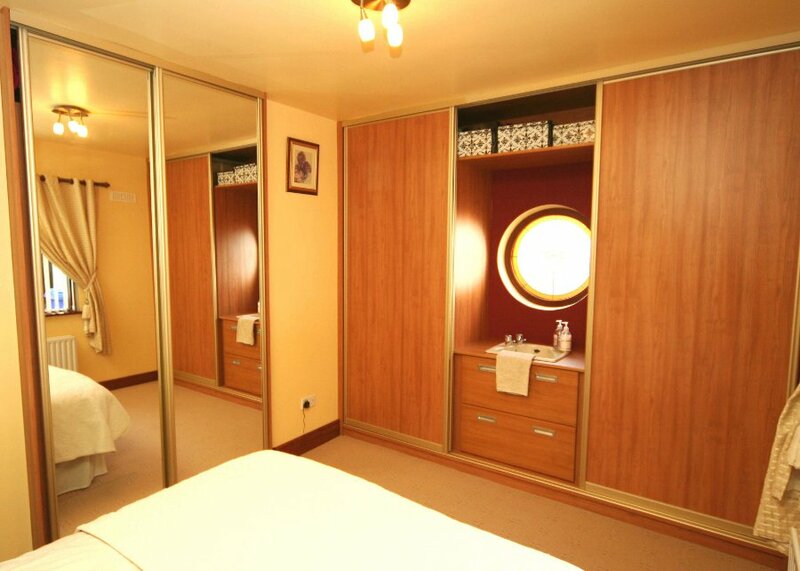 The bedroom should be an area of tranquility and a sanctuary from the stresses of everyday modern life. 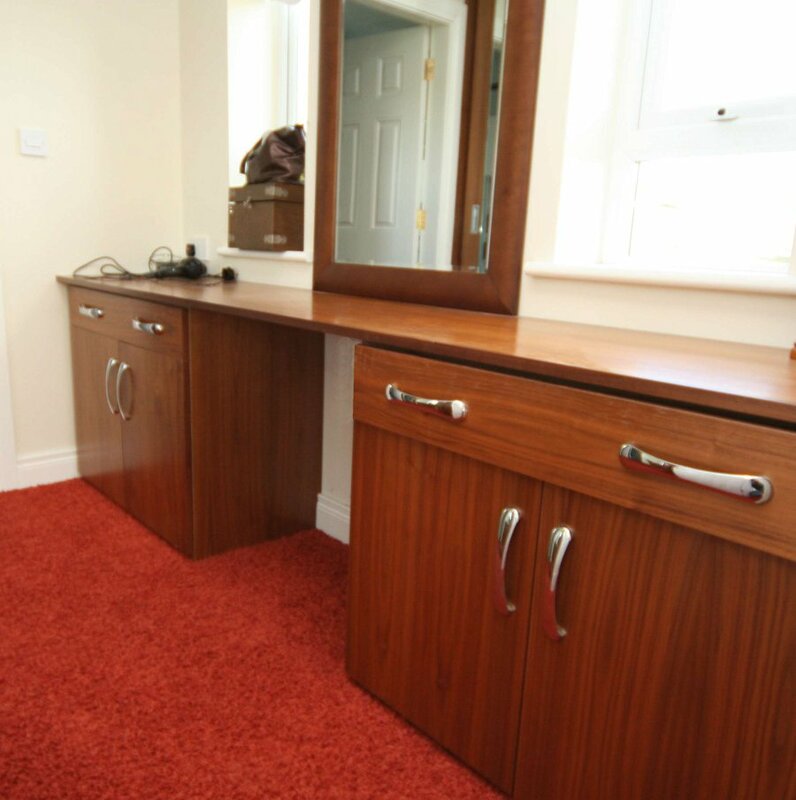 Paul James Kitchens understands that your bedroom is a personal and intimate space. 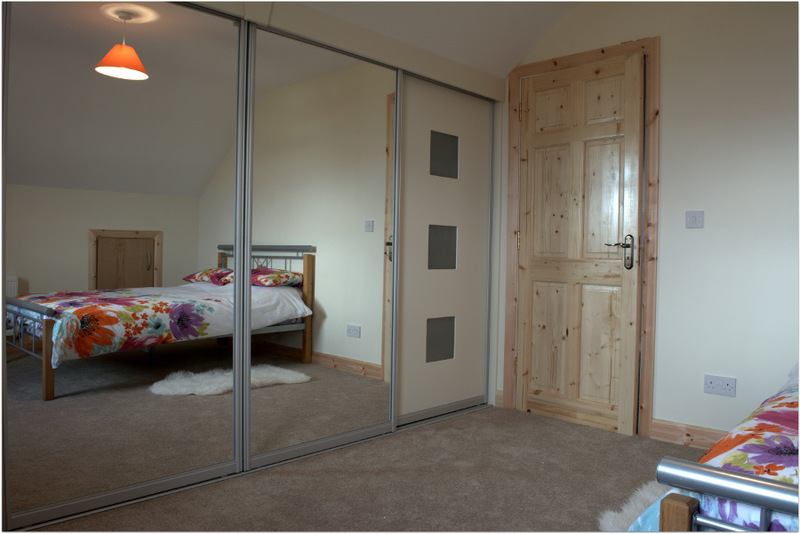 For this reason we design your bedroom to your exact requirements. 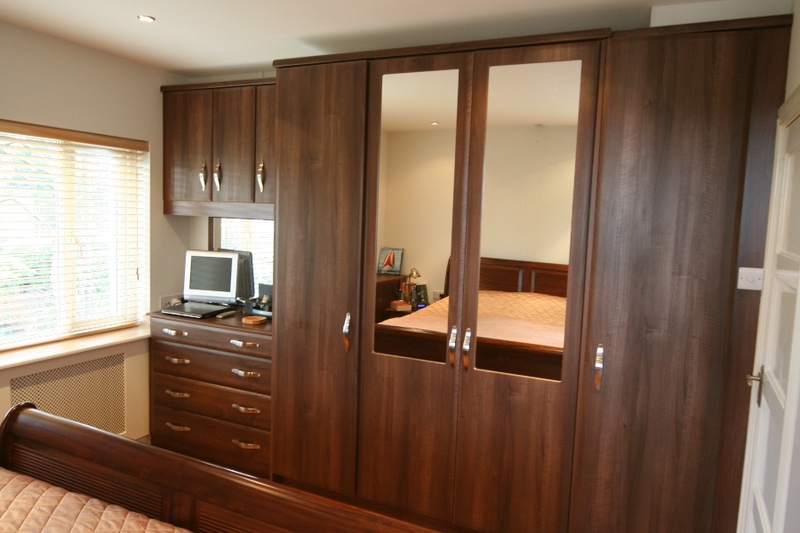 Whatever your requirements, bespoke fitted bedroom furniture is the perfect choice. 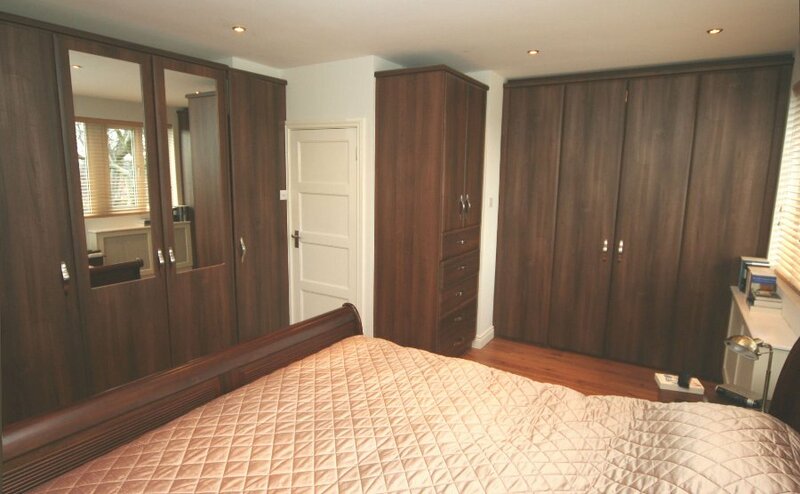 You can choose from fitted wardrobes, sliding door wardrobes and a complete bedroom design. Whether contemporary or traditional. For grown ups or children, the choice is endless. 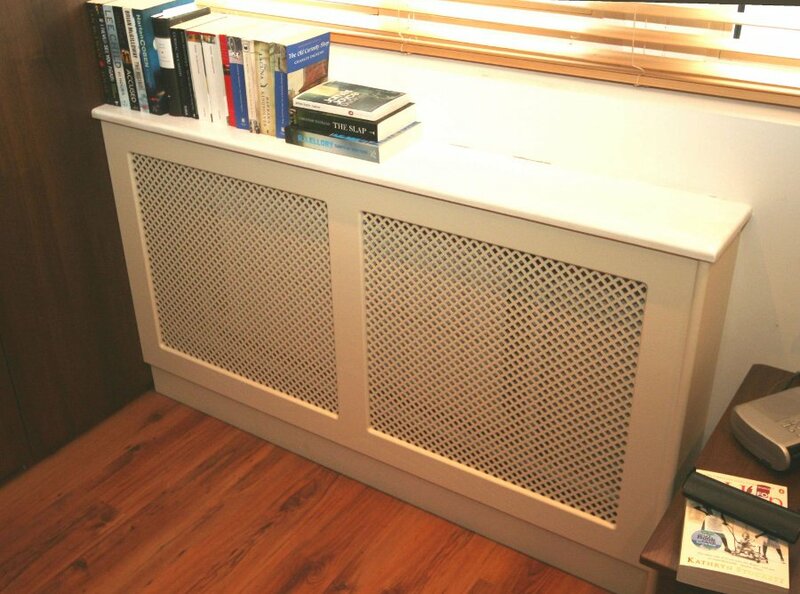 By choosing bespoke storage solutions you ensure that clutter is kept to a minimum, were no space is wasted and everything is in its place. 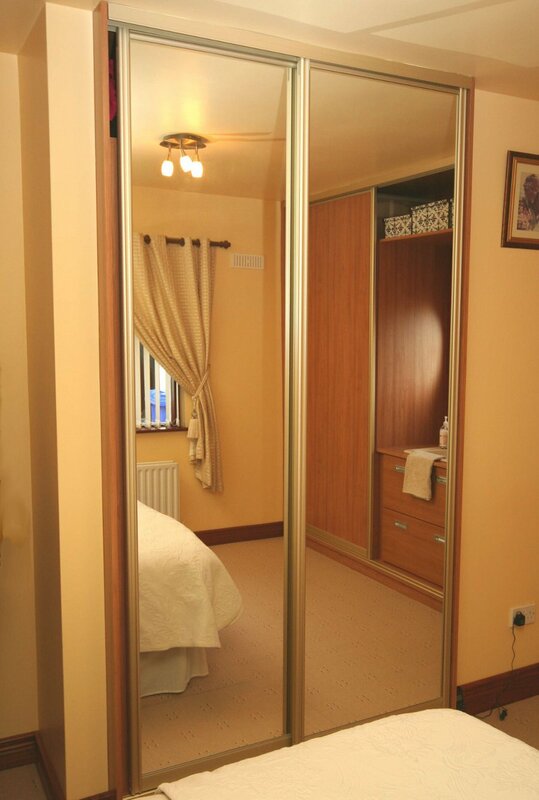 We offer a wide range of finishes to complement your bedroom decor. 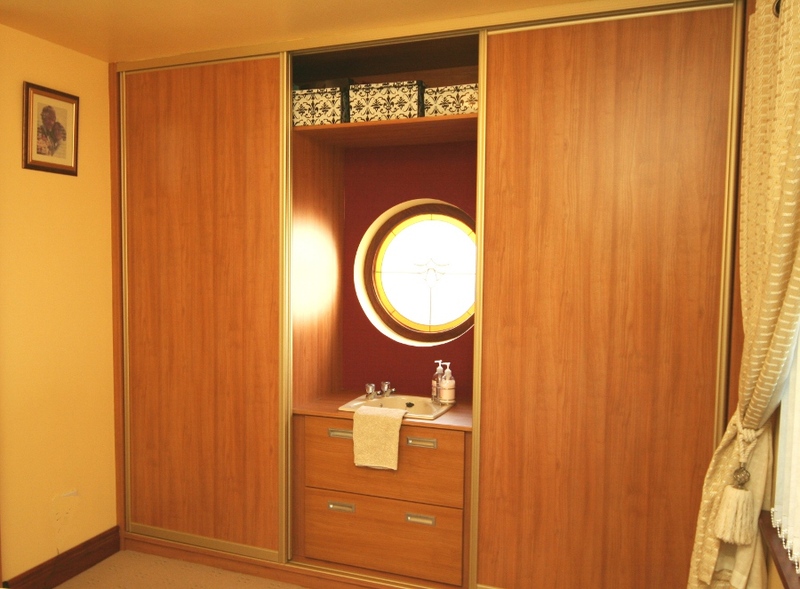 This wardrobe is built into the slope of the ceiling. 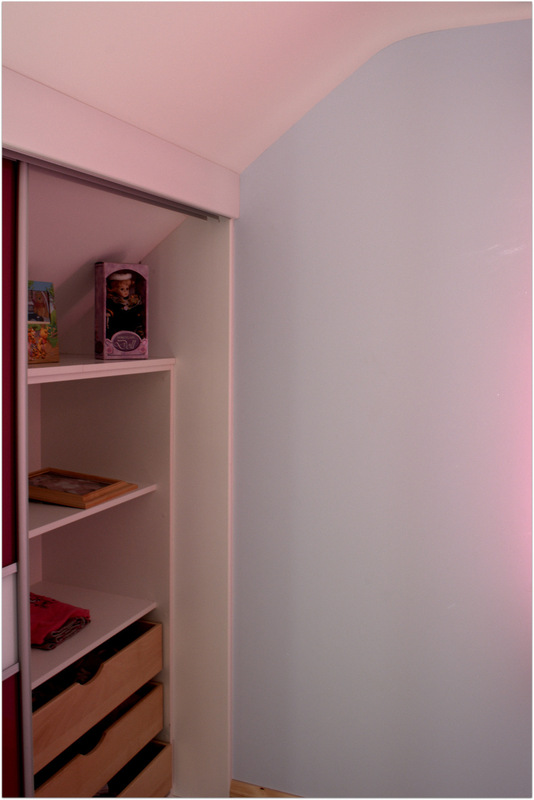 The inside storage maximizes the space. 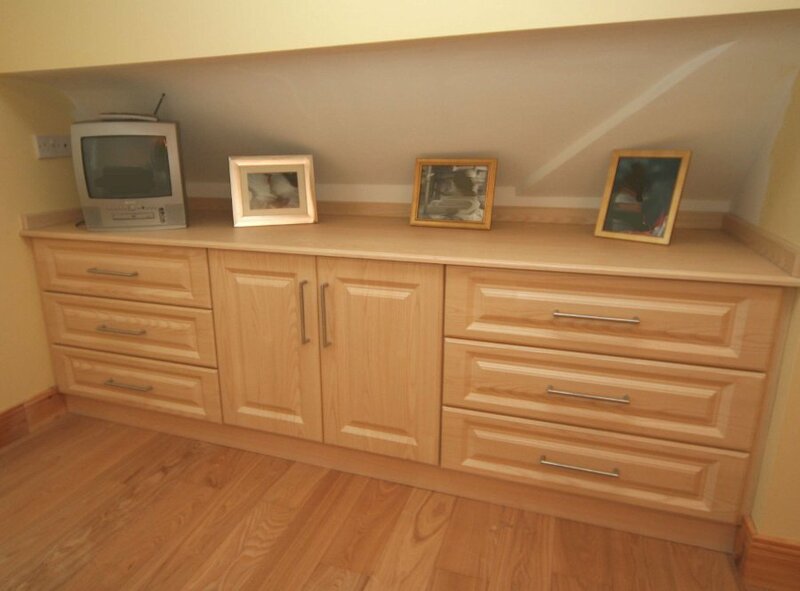 Storage includes full extension drawers, shelving and hanging. 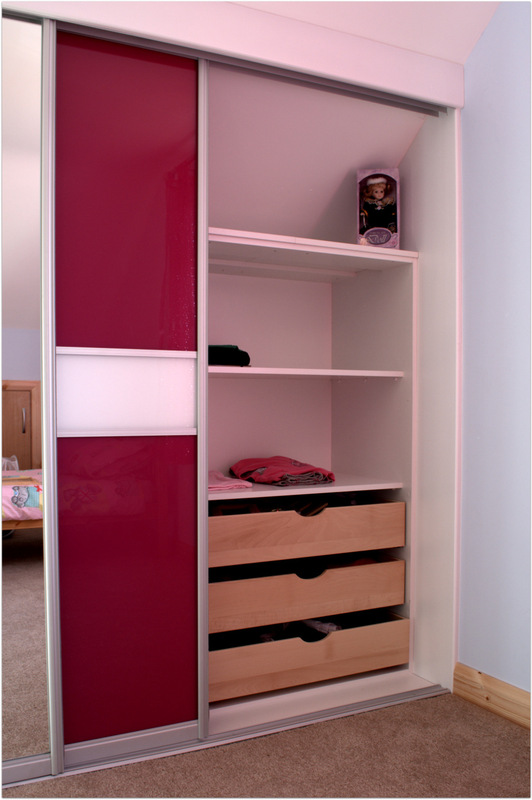 The Hot Pink adds a blast of colour. 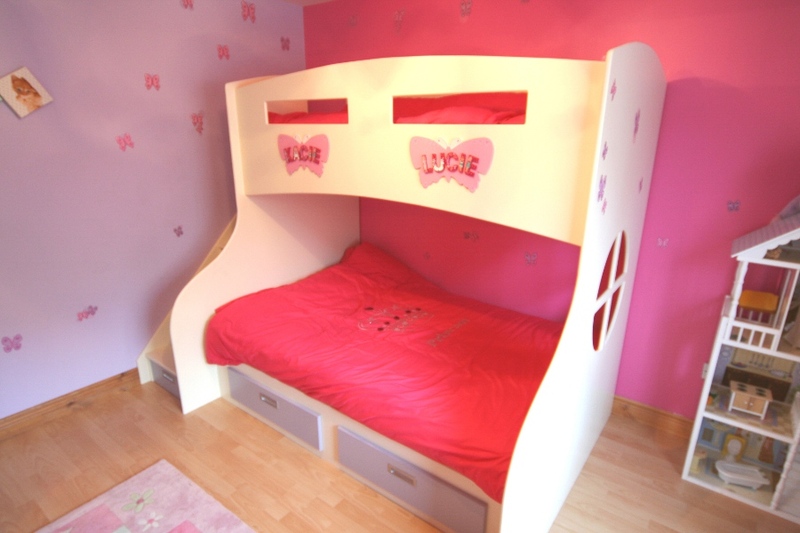 Bespoke Bed - Inishowen, Donegal. 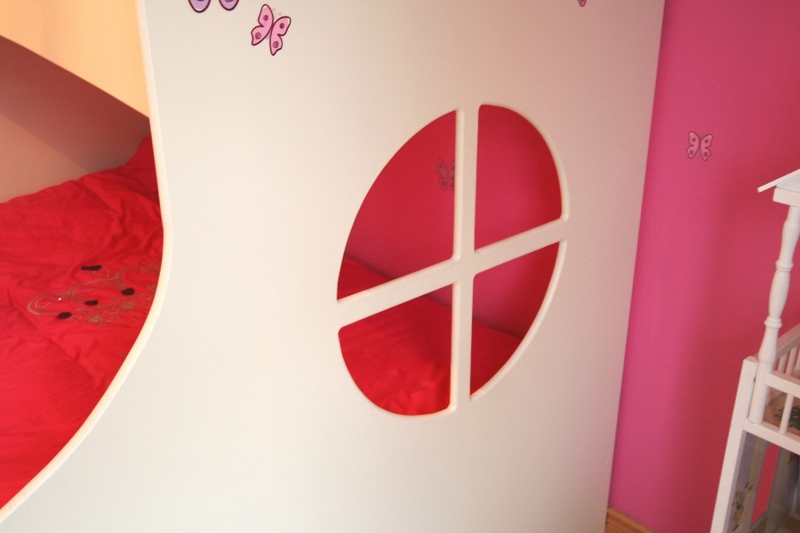 This has to be every little girls dream bed. 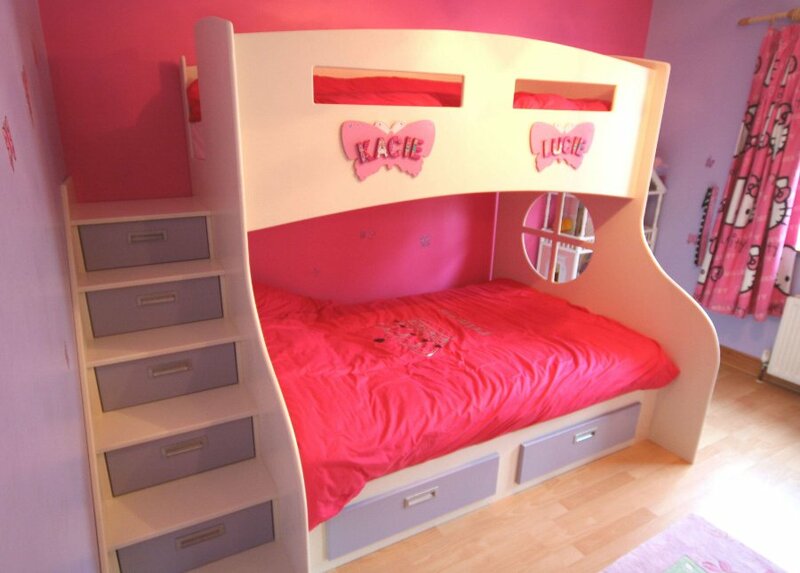 Designed to accommodate two sisters sharing they're room.This bed takes up less floor space than two single beds and it has clever storage with drawers inset into the steps and under the bottom bed. 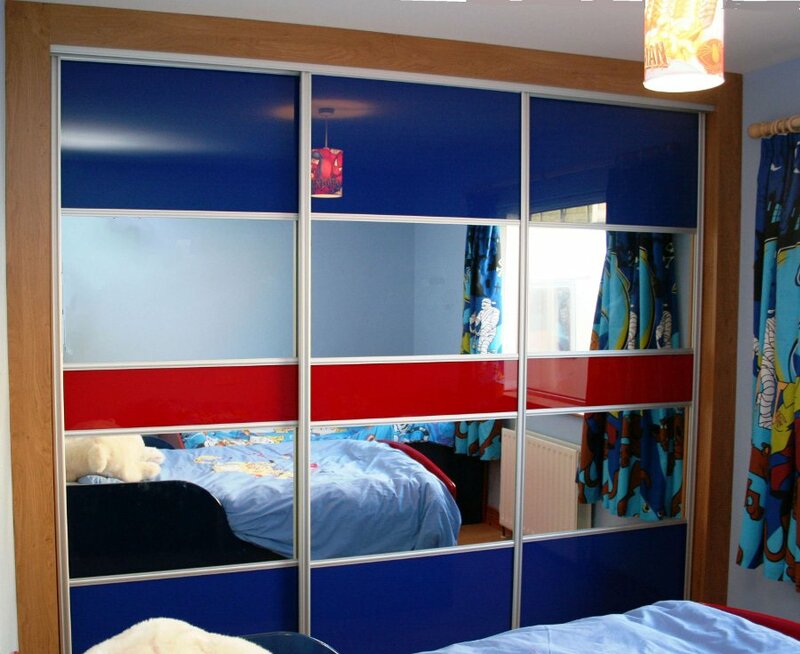 Of course it can be done in blue also for little boys. 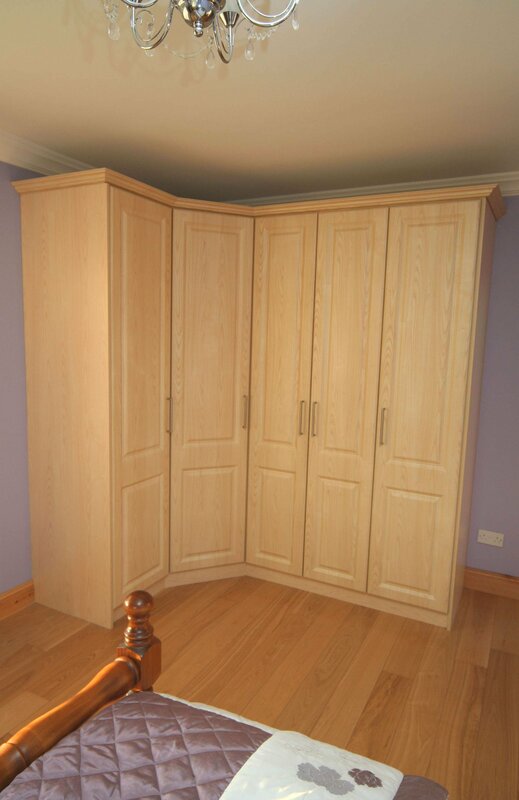 Fuchsia Sliding Wardrobe - Inishowen, Donegal. 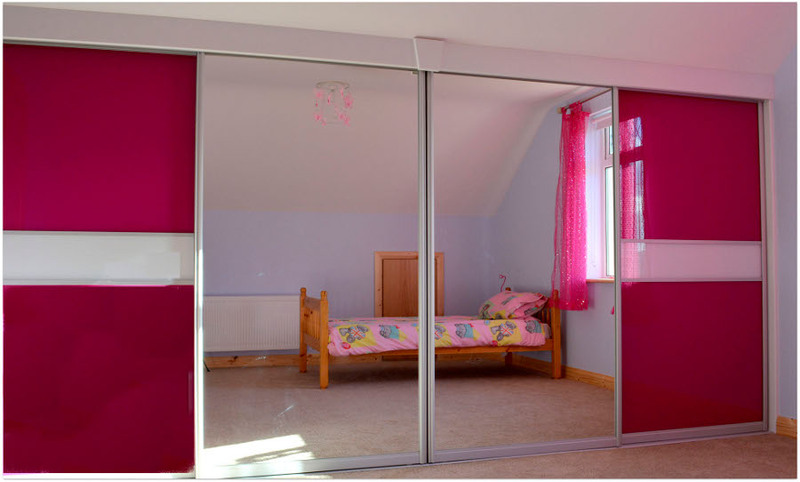 If there is one room in the house that every child should be allowed to influence it should be they're bedroom. 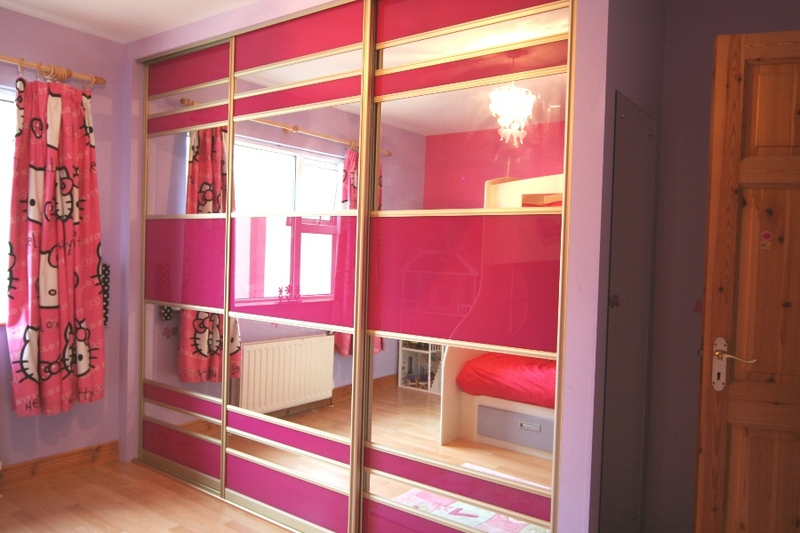 Nothing says a girls room like a sliding wardrobe with fuchsia pink glass and mirrored doors. 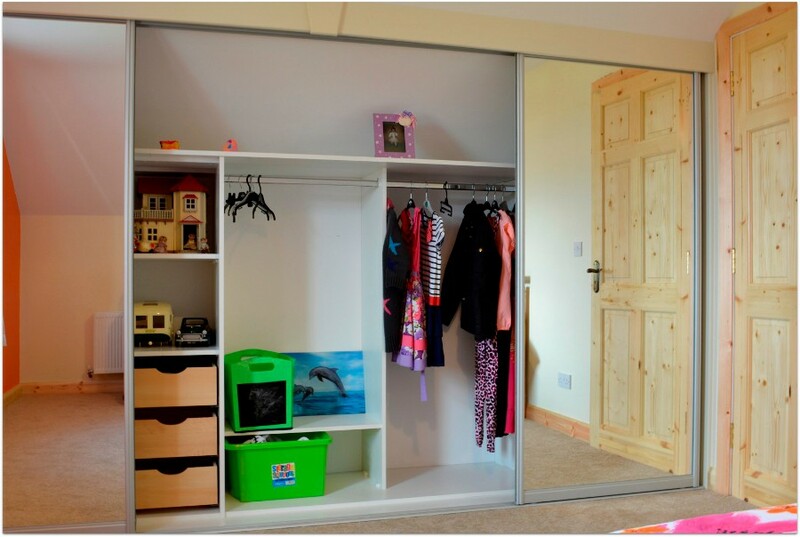 This wardrobe was designed to accommodate young children now and will be easily adapted when the children grow up and they're needs change. 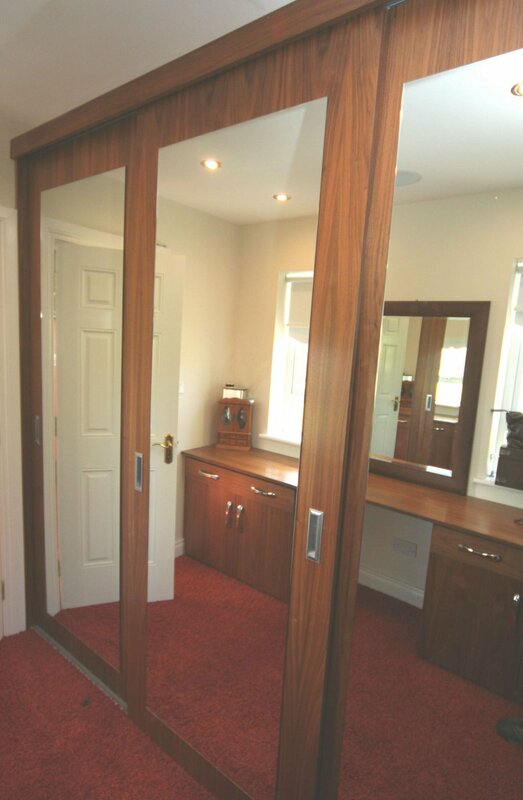 Milano Cherry Sliding Wardrobe - Inishowen, Donegal. 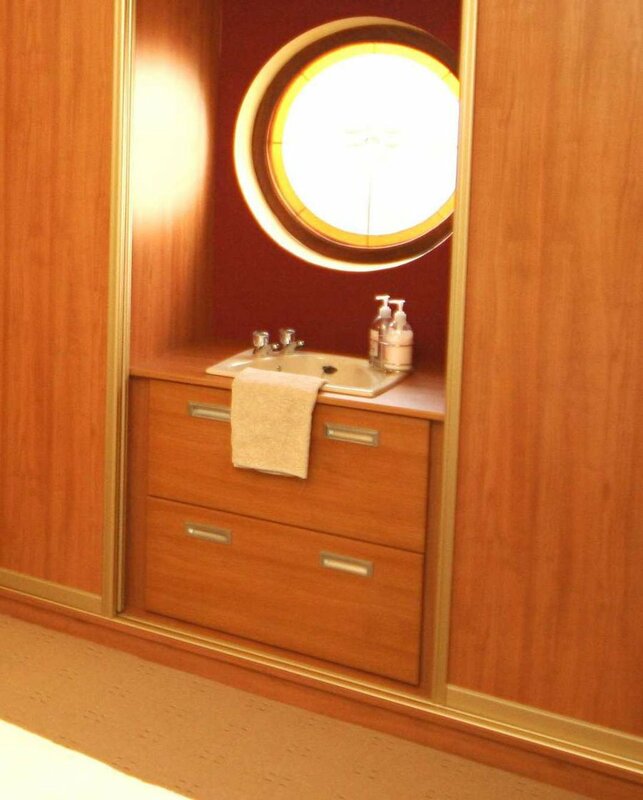 The bespoke wardrobe was created to incorporate an existing porthole window and use it as a feature in the design, with a vanity unit below. 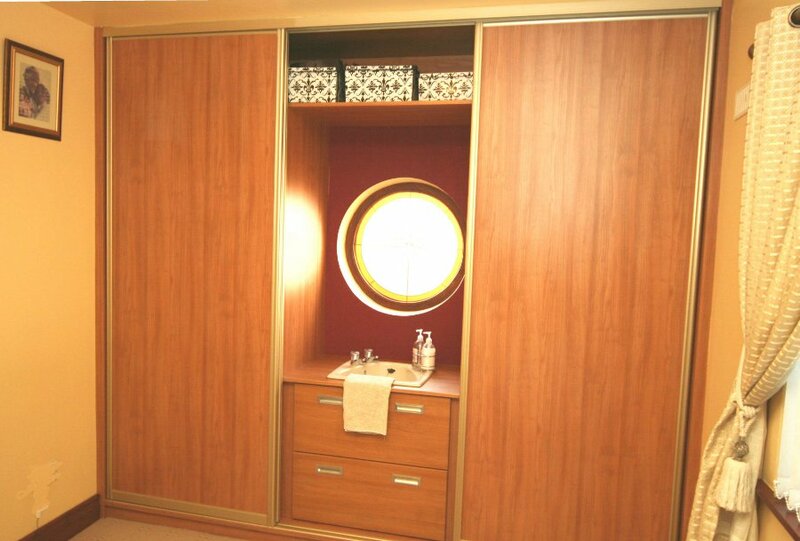 The client added to the opulence of the room by opting for the interior of the wardrobe in the Milano Cherry. 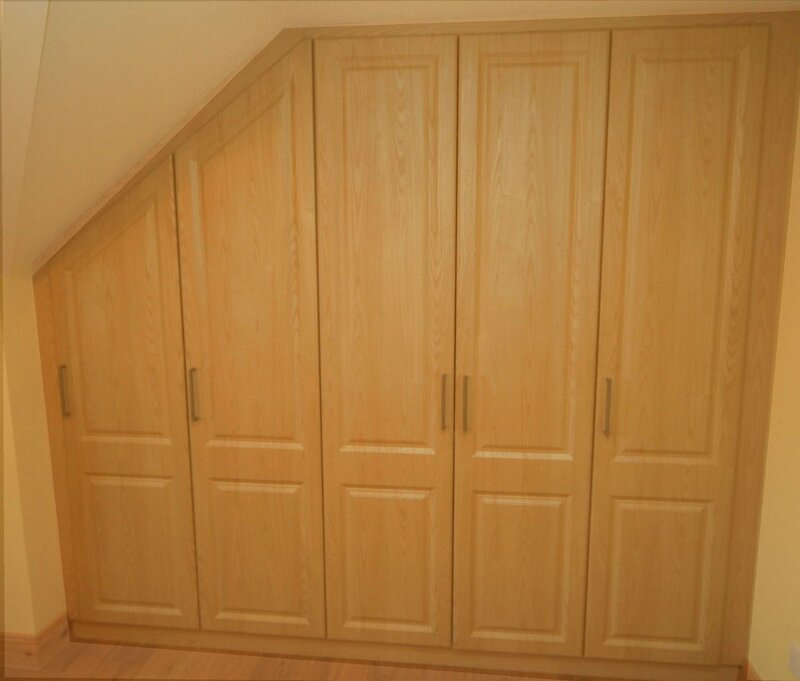 This Ash PVC wardrobe was designed to make clever use of the sloped ceiling in this dormer style house in Kerrykeel. 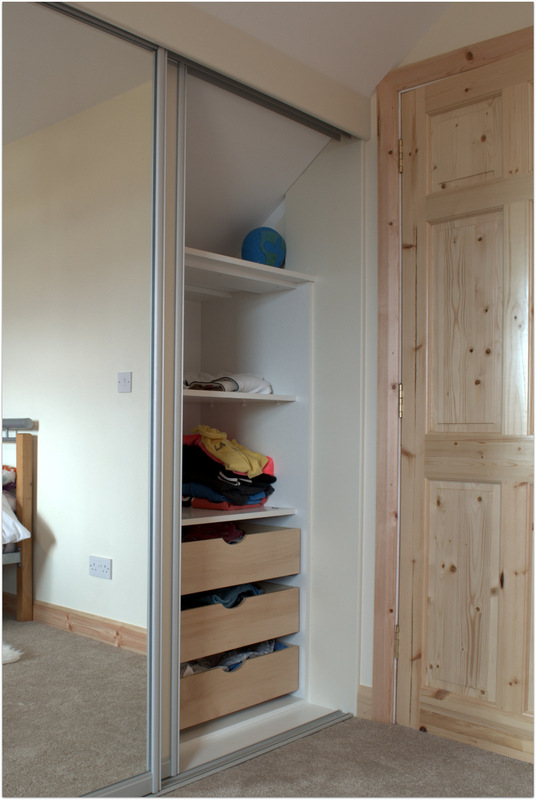 By using angled doors the wardrobe provides ample storage whilst creating a feature. 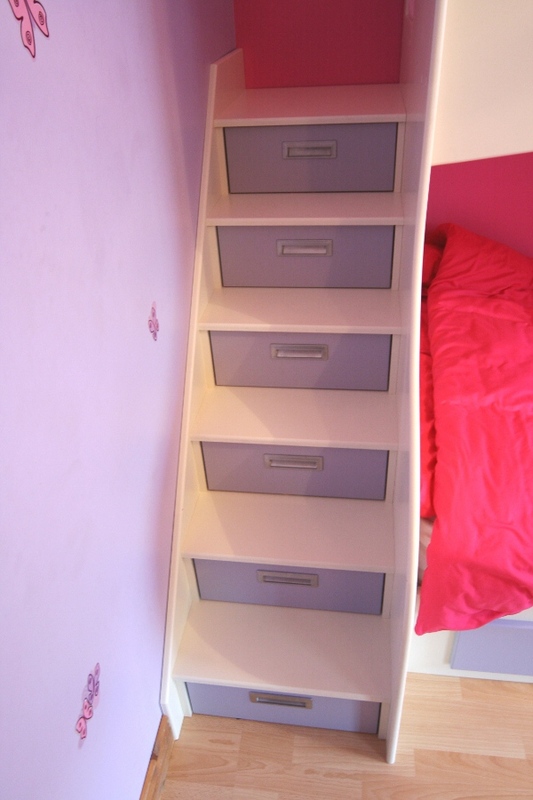 The drawer unit under the slope also adds feature. 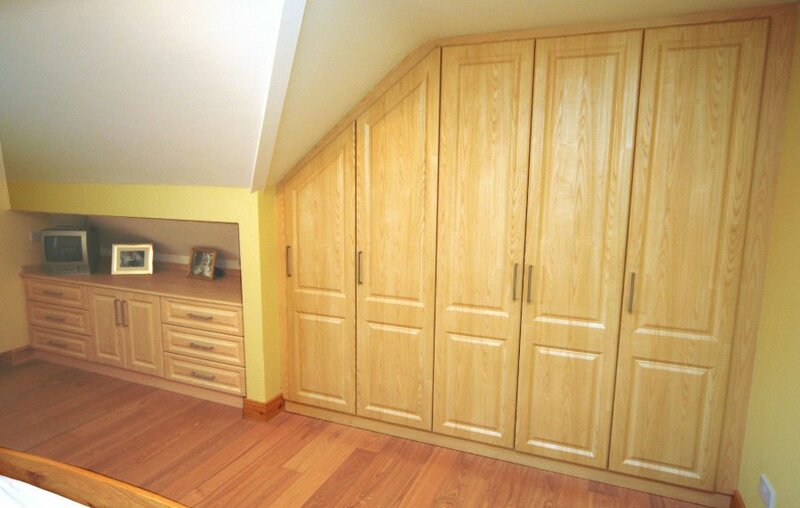 Child's Sliding Wardrobe - Letterkenny, Donegal. 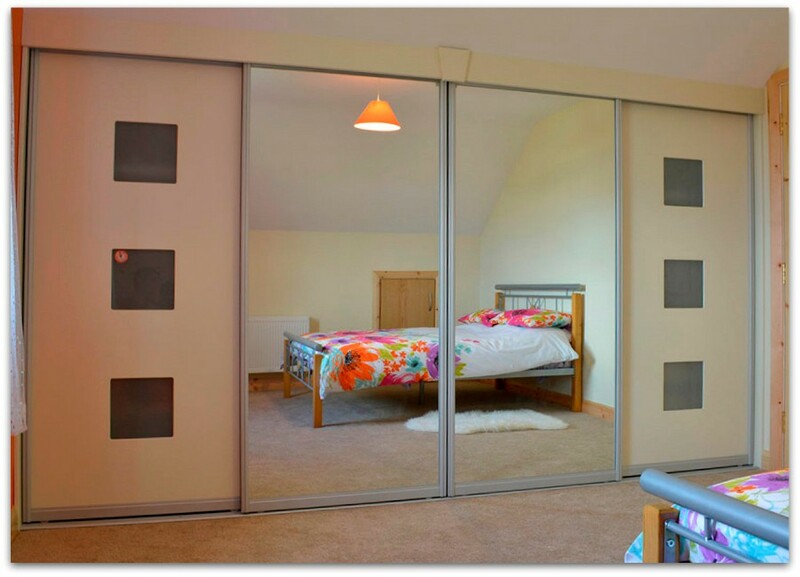 Sliding Door wardrobes are an ideal solution for providing custom storage solutions for any bedroom and with unlimited options on door finishes, personalising a room can be exciting. 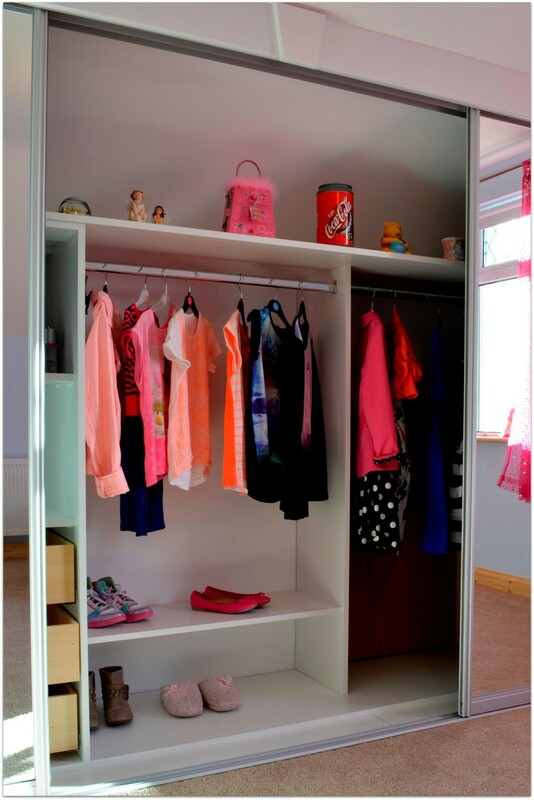 This wardrobe was fitted in a child's room to add instant colour and fun. 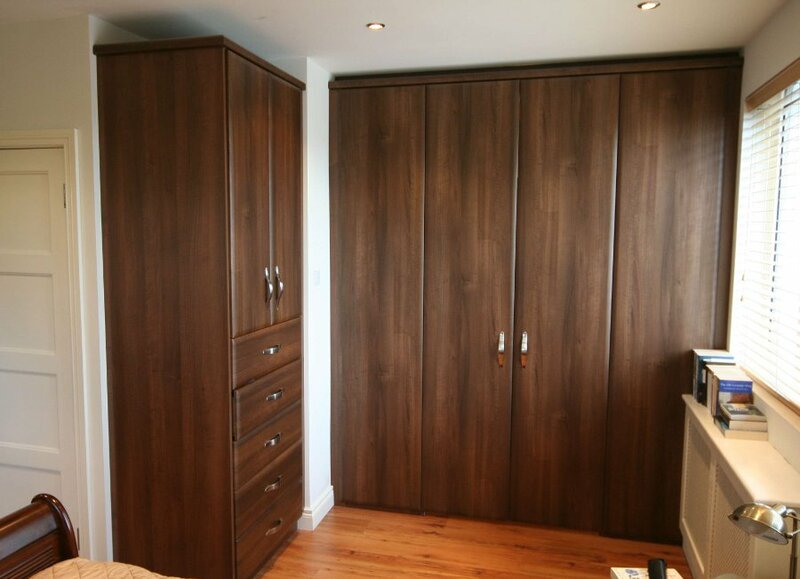 A feature in many modern homes is the walk through wardrobe from the master bedroom to the en-suite. 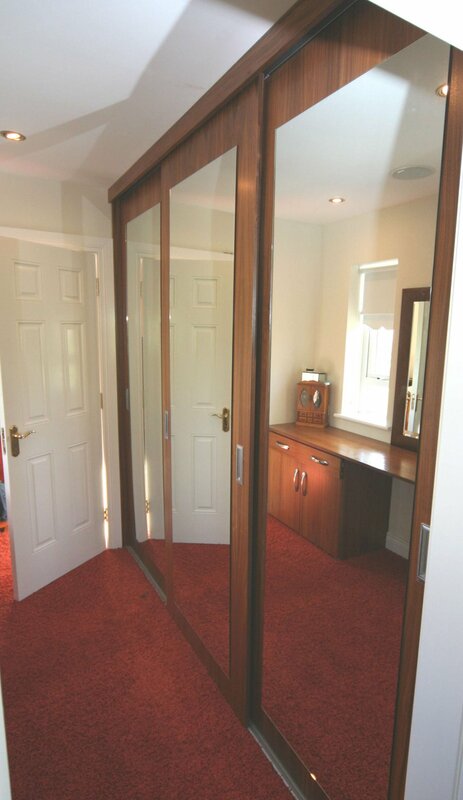 The client chose dark walnut veneered sliding doors, with full mirrors that keep the space bright and airy. 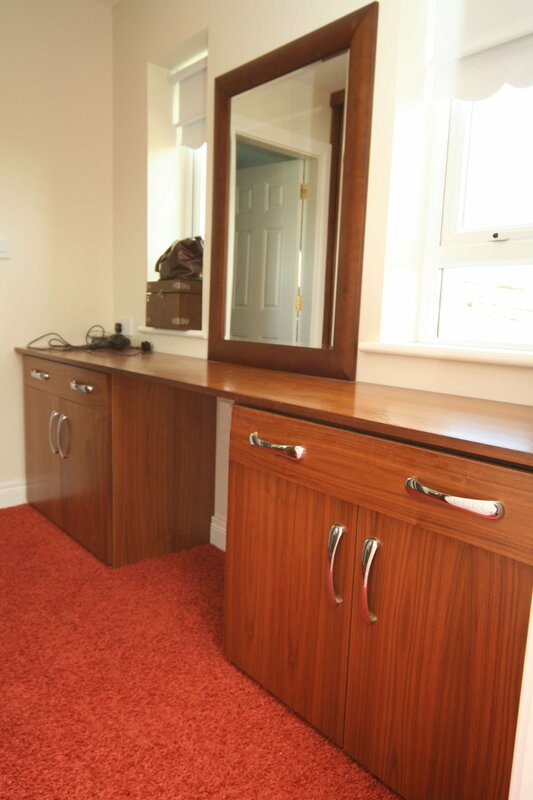 The dressing area provides storage and a seating area. 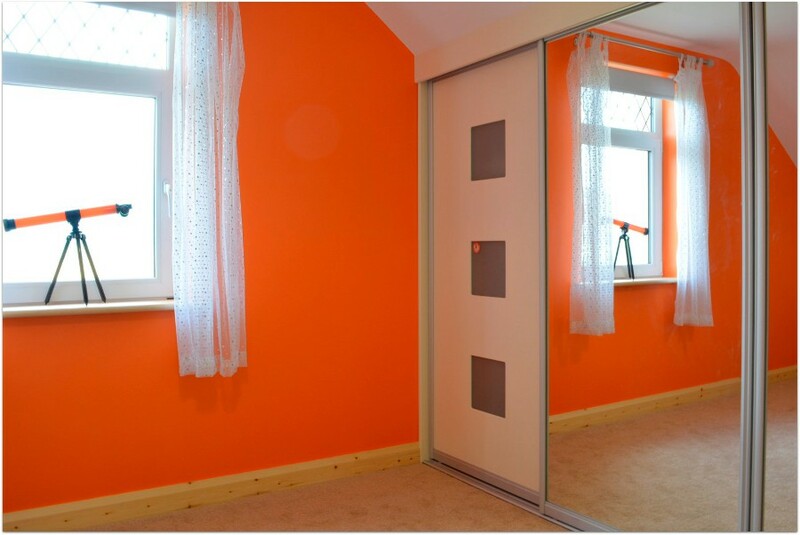 What was originally two smaller rooms, with some structural changes, bespoke fitted wardrobes and new wooden flooring this bedroom was transformed. 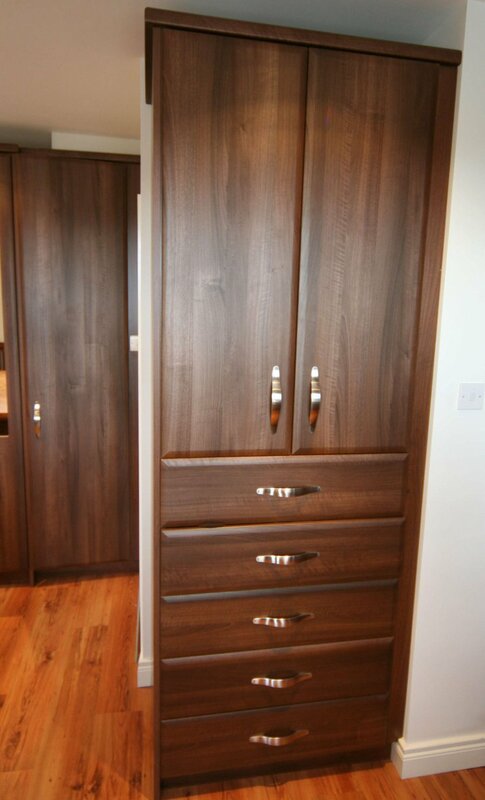 The dark walnut creates an elegant space, and the customised walk in wardrobe provides ample storage.